An easy way to get more hours out of your day is by waking up early. I know, mindblowing. However, if you are struggling with being a morning person - and I am so guilty of that too! -, here is an easy way to train your body to wake up earlier, without feeling tired and grumpy. First, you cannot become a morning person over night. Rather than trying to fall asleep at 10 pm, and waking up at 6 am in the morning, while you are usually the worst night owl, is just bluntly unrealistic. Instead, try to ease your mind into it. Slowly train your brain to wake up a bit earlier everyday. This can be as easy as setting your alarm a couple minutes earlier every night. Do you have trouble falling asleep earlier? Try to create a before bed ritual to prepare your mind you will be dozing off soon. Instead of falling asleep in the middle of the night with your laptop on your lap, try to minimize the use of electronics an hour to 30 minutes before you go to bed. Instead, spend your time listening to your favorite relaxing music or inspiring podcast, drink some tea, or take a bath with calming essential oil. If you feel like you still have a lot of work or study to do, try reading your study books at night before going to bed, rather than reading online articles or checking your work emails. 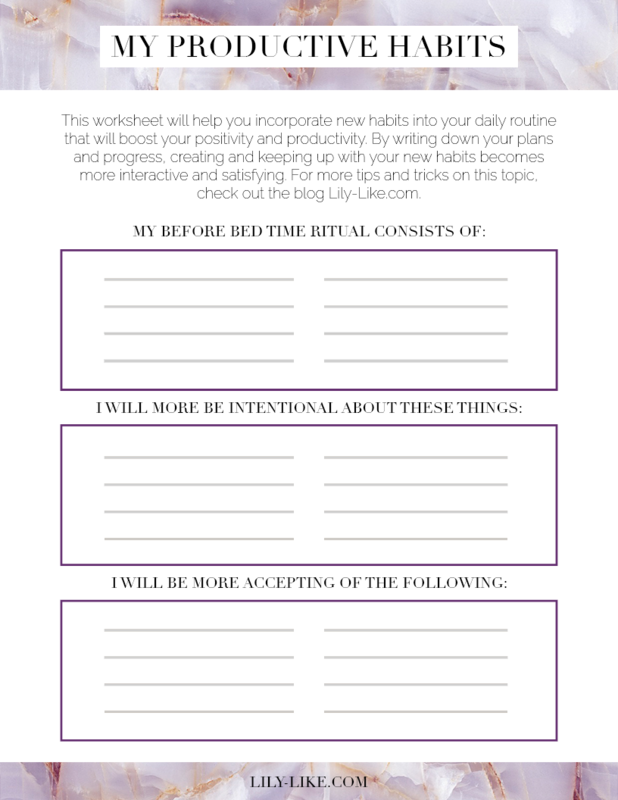 You can personalize your before bed ritual to your own liking - these are just my personal steps I like to add to my before bed routine. Is your biggest issue snoozing too much? Don't feel embarrassed, we've all been there. The comforts of our bed, especially during cold Winter days, can make us want to stay lazy and spend the whole day in bed. Rather than pressing the snooze button a million times, and only getting out of bed an hour later, try to wake up immediately when you hear your alarm. Ditch the annoying buzzing alarm and change your alarm to your favorite motivating or inspiring song, or some calming music if you prefer. Feel invigorated by the music and use it to get up and wake up in a positive mood. Another tip is to not completely close your blinds. I personally find it very difficult to wake up in a dark room. Instead, I prefer waking up by the rays of sun in the morning. That is why I usually keep one blind open, so it is still dark enough to fall asleep, yet light enough to wake up naturally in the morning. Last but not least, you can put your alarm clock or phone on the other side of the room. This way, you have to get up in order to switch off the music. Another habit that will boost your productivity is to be more intentional with our time. The time we are able to spend on this earth is our most precious gift of life. However, why do we so often treat it worthlessly, and spend it so often procrastinating? A positive habit you can incorporate into your daily routine to be more productive is to practice intentionality. The idea of intentionality is a huge topic in philosophy. Great philosophers such as Plato, Kant, and Brentano, have all discussed their vision of intentionality. Intentionality comes from the Latin word intentio, meaning 'directed at. '1 Intentio is in turn derived from the Latin verb intendere, meaning being directed towards some goal or thing.2 Intentionality stands for the power of our minds to be about, to represent, or to stand for, things, properties and states of affairs.3 Intentionality in philosophy has often been discussed in the light of the mysteries of our mind: what are minds, how do certain mind states relate to our physical states, and how do they influence our day to day behaviour? Brentano believed that (i) all conscious states are intentional, and (ii) all intentional states are conscious. However, if all conscious states are intentional, what about mindless procrastination, or that auto-pilot feeling we all have experienced at some point? This does not seem to fit Brentano's premisses, and could be defined as a conscious state without intentionality - a category that is unproductive, and we definitely don't want to be in. Put in a more simple way, being intentional means that whatever you do, you do it while being mindful of the goal you are aiming to achieve. Even though understanding intentionality on a ontological or metafysical level is quite challenging, becoming more intentional doesn't have to be. A simple way to cut down the time you waste on mindless activities, is to stop checking your phone and social media every couple minutes. Scrolling through Instagram pictures, or constantly checking your messages will not bring you closer to your goals. Instead, turn off the notifications of your phone, put it on silent, or turn it off completely. It is okay to not be connected 24/7. Another method you can use to be more intentional is to write down the things you want to do in a day. Don't feel pressured to plan out every minute of your day. Use a method that works for you - this can be a special planner or just a to do list. By writing down your goals for the day, and actively engaging with what you want to achieve, you become more aware of what you are actually doing, and will feel more focused to finish those tasks too. Last, but not least, intentionality is not only relevant for your big and improtant deadlines; especially the little things, such as eating breakfast, cleaning your apartment, or doing your skincare routine can be easily enjoyed when becoming more mindful of them. If you don't feel like doing it, don't force it. Our mind is not a machine, and we cannot expect it to work every moment of the day. If you try to study the materials for your next lecture, but instead you're end up re-reading the same sentence over and over again, not actually grasping the essence of what it actually said, you're not being productive. Especially working in a creative industry, I know how counter-productive it can be to force certain to dos. Whenever I film a video or write a blogpost when I don't feel like it, I can just tell from the finished product. I usually end up not using whatever I created, so even though I worked, de facto, I wasted my time and wasn't productive at all. That is why it is important to incorporate acceptance as a habit into your routine. It is okay to have an unproductive day, to not check off every item of your to do list, or to fall behind schedule. The best way to be productive is not by getting frustrated with yourself - it is by accepting you are human, and trying again. Even if you didn't do a perfect job, you came closer to your goal than you did yesterday. Acceptance is a very important mind state and you should definitely practice it as often as you can. After accepting yourself, and trying again, you should also reward yourself. We live in an age where everyone wants to live the perfect life. And if we are not even remotely close to this ideal, we feel like we don't deserve any rewards for our accomplishments. However, small changes or signs of growth deserve appreciation too. Want even more tips? Check out my video I made on this topic as well. I hope it made you feel inspired to incorporate these habits in your routine too. These habits will for sure boost your positivity and productivity! Don't feel pressured to add every habit to your routine in an instance. Creating and changing a routine is not easy, so take all the time you need. If you have any other habit that really boosts your positivity and productivity, feel free to share it in the comments down below. DO YOU HAVE ANY HABIT TO BOOST YOUR PRODUCTIVITY AND POSITIVITY? P.S. If you liked reading this blogpost, also check out this blogpost about Knowing & Growing Your Self-Worth. Jacob, Pierre, "Intentionality", The Stanford Encyclopedia of Philosophy (Winter 2014 Edition), Edward N. Zalta (ed. ), URL = <https://plato.stanford.edu/archives/win2014/entries/intentionality/>.